1/2 20-1/4 9-1/2 9-1/4 34 706 1059 2"
1/2 23-1/4 12 11-1/2 34 706 1059 3"
1/2 26-1/2 14 12-1/2 34 706 1059 4"
Copper Sweat Loops are designed specifically for copper piping systems. They are constructed with copper female sweat ends and copper elbows and either stainless steel braided hose or bronze hose, depending on size. 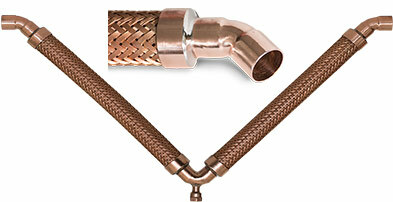 Those loops using stainless steel braided hose will also utilize stainless steel 90-degree return elbows. As in other configurations of Seismic “V” Loops, choose from either 2″, 3″ or 4″ of motion from center-line. We can also add an eyelet at the 90 degree elbow to accommodate a support rod or cable.